RECEIVING: Gilbert – Thomas Casey 3-51, John Ambrozaitis 1-11; Seth Dayton 1-31, Nick Pedrolini 2-21; SMSA/Unv. – Kayron Macon 4-68, Patrick Richards 1-minus 2. Two Tigerhawks earned first team All-Pequot Conference Uncas Division honors in recent All-Star balloting by the league coaches. Junior Kadeem Johnson and junior lineman Shawn Lozada were named to the first team with junior QB Wilfredo Alicea earning second team honors. Johnson began the season as a wide receiver and defensive back, catching six passes for 50 yards. But when Kayron Macon got hurt midway through the season, Johnson began to get more carries at running back, rushing for 483 yards and 4 TDs in the final five games of the season. Johnson for a career high 181 yards against Housatonic/Wamogo, a contest where he returned a kickoff 74 yards for a touchdown. Lozada played on both sides of the ball for the Tigerhawks. 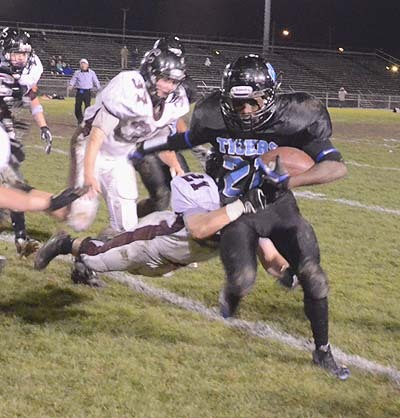 For nine of 10 weeks, Alicea was the team's leading rusher. He ran for 705 yards and six TDs on 116 carries. He completed 58-of-156 passes for 820 yards and six TDs this season. Johnson, Lozada and Alicea will be among 10 starters that will return to the Tigerhawks next season. It looks to be a season of potential next fall thanks to the fact that many freshmen and sophomores earned varsity playing time with SMSA/University. ENFIELD, Nov. 22 – Enfield QB Kyle Maynard completed 10-of-15 passes for 183 yards and 3 TDs to lead the host Raiders to a big Thanksgiving morning victory over SMSA/University, 50-16. Maynard threw a pair of TD passes in the first quarter as the Raiders grabbed an early 21-0 lead. Enfield extended its lead to 35-0 at halftime. Nick Bevilacqua ran for 2 TDs and 109 yards for the Raiders. For the Tigerhawks, Kadeem Johnson ran for a pair of fourth quarter touchdowns and a team-high 80 yards. QB Wilfredo Alicea scrambled for 59 yards on eight carries. 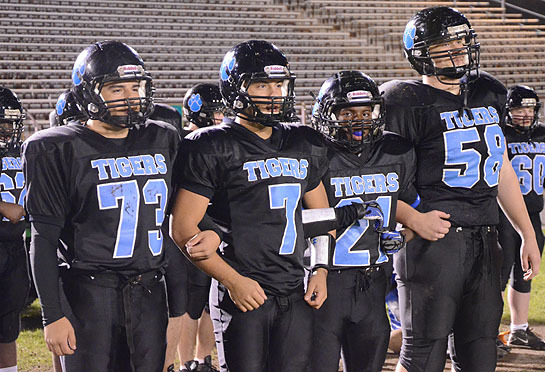 It was the final high school game for eight Tigerhawk seniors – Ian Andino, the injured Kayron Macon, Wendell Rhoe, Paul Zabulis, Everett Martell, Jeff Gegetskas and Andrew Klavins. HARTFORD, Nov. 16 – The Tigerhawks took the field Friday night against Canton with four freshmen in the starting lineup. Since opening day, there are eight different starters on the field. The Tigerhawks are making plays but they are also making crucial mistakes that are hampering their chances for success. HARTFORD, Nov. 10 – The Tigerhawks had two kickoffs returned for touchdowns to beat Housatonic/Wamogo, 28-14 on Saturday night at Dillon Stadium and win for the third time in four games. It’s first time in the program’s history with two kickoff returns for touchdowns in a single game. Eloy Aguayo had an 80-yard kickoff return in the first quarter while Kadeem Johnson had a 74-yard return for a TD in the second quarter. Johnson also ran for a career-high 181 yards on 18 carries. Twice, Housatonic/Wamogo (0-8) tried to take command of the game only to see the Tigerhawks return kickoffs for touchdowns. Matt Perrotti’s nine-yard TD run gave the visiting Mountaineers an 8-6 lead before Aguayo ran back the kickoff 80 yards for the score. Daunte Brinkley caught the two-point conversion pass from Wilfredo Alicea to give SMSA/University a 14-8 lead. After Housatonic cut the lead to 14-12 on a John Haddon 1-yard run, Johnson’s kickoff return for a TD extended the lead to 20-12. Ezequiel Ortiz’s second TD of the game in the third quarter and a two-point conversion run by Johnson extended the Tigerhawk lead to 14 points. SMSA/University improves to 3-5 on the season and will host its final home game of the season on Friday against Canton at 6:30 p.m. at Dillon Stadium. For Housatonic, which runs the run-oriented single-wing offense, Anthony Zucco and Doug Whipple each ran for 106 yards while Perrotti ran for 83 yards. WINDSOR LOCKS, Nov. 3 – The Sport Medicine Science Academy/University High football team got back on the winning track Saturday by running the ball well in a 29-12 victory over Windsor Locks/Suffield/East Granby. The Tigerhawks ran for 270 yards and three TDs, led by Ezequiel Ortiz with 120 yards and 1 TD on 26 carries. The team’s leading rusher, QB Wilfredo Alicea, scrambled for 78 yards and a TD on 19 carries while Kadeen Johnson ran for a career-high 72 yards and 1 TD on 12 carries. Sophomore Daunte Brinkley had a breakout game with an acrobatic 40-yard reception and touchdown on a third down and 15 play in the fourth quarter that helped the Tigerhawks (2-5) close the door on the Raiders. Brinkley led the team in tackles and forced a fumble. Offensively, he did an excellent job as a lead blocker. The victory gave SMSA/University its second win in three games. The Tigerhawks will look to make it two straight victories when they host winless Housatonic/Wamogo (0-7) Saturday night at Dillon Stadium. The Tigerhawks got some fine rushing plays from QB Wilfredo Alicea, who scrambled for 15 and 19 yards on SMSA/University’s first scoring drive in the third quarter. He also had runs of 24 and 14 yards in the fourth quarter. Ezequeil Ortiz also scored on a pretty 55-yard touchdown pass from Alicea, breaking two tackles, racing down the sideline and then cutting back toward the middle of the field score a touchdown with 3:35 remaining in the game that cut Granby’s lead to eight points. But on the other hand, the Tigerhawks had two turnovers, including a key fumble midway through the fourth quarter, trailed 20-0 at halftime and allowed the visiting Bears to convert twice on fourth down in the first half. SMSA gained just one first down on its first three drives. Granby took the lead on a short five-play drive late in the first quarter. A short screen pass from Granby QB Curtis Fields to Caleb McCullin turned into a 57-yard gain down the left sideline to the Tigerhawk 10-yard line. Four plays later, Fields scored from the one-yard line for a 7-0 Granby lead. Early in the second period, McCullin recovered a SMSA fumble at midfield and Granby marched downfield thanks to nice runs from freshman Dominic Pagano (15 yards), McCullin and Stephen Blake. The Bears took a 14-0 lead on a 14-yard TD pass from Fields to Pagano. Granby extended its lead to 20-0 on a nice 12 play, 72 yard drive that ended with Kenneth Mouning pulling a 14-yard TD pass from Fields with 22 seconds left in the half. Granby converted three times on third down to keep the scoring drive alive. SMSA/University got on the board with no time left on the clock in the third quarter on a one-yard run from Ortiz. Alicea completed a 16-yard pass to Daunte Brinkley to move the ball into Granby territory. On third down and 10, Alicea scrambled for a 19-yard gain to the Granby 25. Two plays later, Alicea scrambled 15 yards to the one. On its next drive, Granby drove to the SMSA 10-yard line before the drive stalled. One play later, the Tigerhawks fumbled the ball away and the Bears were able to run off another two minutes. Granby had a first and goal on the 10 but couldn’t convert. A 14-yard run from Alicea on third down kept SMSA’s drive alive before Alicea found Ortiz for the 55-yard touchdown reception with 3:35 left in the game. The conversion run failed and Granby led, 20-12. SMSA did get the ball back with 47 seconds left but didn’t get past their own 35-yard line before time expired. HARTFORD, Oct. 20 – Stepping in for the injured Kayron Macon, Ezequiel Ortiz ran for a career-high 166 yards and 2 TDs to help lead SMSA/University to its first victory of the season with a 36-30 win over Stafford/East Windsor Saturday in double overtime at Dillon Stadium. In overtime, each team gets the ball at the 25-yard line. The Tigerhawks (1-4) scored first on Wilfredo Alicea’s 1 yard run – his third TD of the afternoon. Ortiz scored on the two-point conversion to give SMSA/University an eight-point lead. But Stafford (1-4) tied the game with a four-yard TD run from QB Tom Ford and a two-point conversion caught by Zach Rollins from Ford. In the second OT, Ortiz scored from the five-yard line. The Tigerhawks failed to convert on the two-point conversion but still led by six. SMSA/University’s Kadeem Johnson clinched the win when he made an open field tackle at the two-yard line. The game was won on the ground. The Tigerhawks didn’t complete a pass but they were able to move the ball on the ground. Alicea ran for 43 yards and three TDs. A one-yard run in the fourth quarter by Alicea and a two-point run from Ortiz gave SMSA/University an eight-point lead. But Stafford cut the lead to two points, 22-20 when Rollins pulled in his second TD pass of the afternoon, a 19-yard pass from Ford. Connor Hutchins’ two-point conversion pass tied the game at 22-22. Rollins caught nine passes for 209 yards for Stafford. It’s the second OT game in Tigerhawk history and their second OT victory. 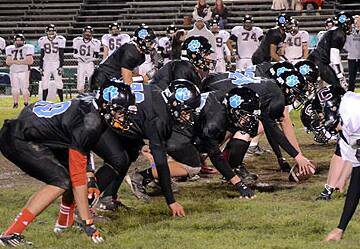 SMSA/University beat Lewis Mills, 24-18 in the 2010 season. COVENTRY, Oct. 13 – For the first time this season, the Tigerhawks got off to a strong start and grabbed the lead. But some key mistakes hurt as Coventry/Windham Tech/Bolton rallied for a 21-20 decision on Saturday. SMSA/University had a 14-point lead in the first quarter and a six-point lead in the fourth quarter but couldn’t close out the contest. Tigerhawk QB Wilfredo Alicea ran for a team-high 123 yards and a touchdown. He also completed 15-of-27 passes for a career-high 212 yards and one TD. Kayron Macon pulled down 10 receptions for 177 yards and one touchdown. The 10 catches and 177 yards are both career highs for Macon. SMSA/University (0-4, 0-4 Pequot Uncas) led 14-0 after one quarter on a 1-yard run by Alicea and a 40-yard touchdown reception by Macon from Alicea. The Patriots cut the lead to eight, 14-6, at halftime on a touchdown pass to Nathan Decker from Devan Valdez. The Patriots tied the game on an 80-yard kickoff return from Kyle Wing and a successful two-point conversion run. SMSA/University extended its lead to 20-14 on a one-yard run from Macon. While the Tigerhawks missed the extra point, SMSA/University still held a six-point lead. But Tommy Myers, the Patriots’ 6-foot-5, 240 tight end and linebacker, turned the game around. Myers, who will attend the University of Connecticut next year to play football, intercepted an Alicea pass and returned it 16 yards for a touchdown. Myers added the crucial extra point that made the difference. HARTFORD, Oct. 6 – According to reports from the Republican American in Waterbury, the student who tried to commit an apparent suicide on Friday night in Winsted was listed in critical but stable condition on Saturday at the Children’s Medical Center in Hartford. The young boy is a student at Northwestern Regional and grief counselors were made available Saturday for students at Northwestern. WINSTED, Oct. 5 – The Tigerhawks were able to move the football Friday night in their Pequot Conference game against Gilbert/Northwestern. But they couldn’t convert their opportunities into points and gave up some big plays on defense in a 35-0 defeat that left them at 0-3 on the season. “We made too many mistakes and they were self-inflicted. You have to come to play and you have to be a player,” SMSA coach Graham Martin said. WINSTED, Oct. 5 – The Pequot Conference game between Gilbert/Northwestern and Sports Medicine Science Academy/University High was ended with 10:07 left in the fourth quarter after a young boy tried to commit suicide on The Gilbert School campus Friday night. The game was stopped and Van Why Field was cleared of players, officials and spectators because police said that the Life Star helicopter from Hartford Hospital was going to land on the field. Life Star didn’t land on the field but landed in the parking lot of the old Winsted Memorial Hospital, which overlooks Van Why Field, and transferred the boy to Hartford Hospital. Police had no additional information to share on the boy’s condition immediately after the game had concluded. The head coaches of both teams were in agreement that the game should be ended. Gilbert/Northwestern was leading at the time, 35-0. HARTFORD, Oct. 1 – For the second straight week, a lackluster first half performance put the Sports Science Medicine Academy/University High football team on the defensive. The Tigerhawks gave up four TDs in the first half and trailed 28-0 at halftime. But SMSA/University played a much more inspired game in the second half in a 42-19 loss to Avon at Dillon Stadium Monday night. 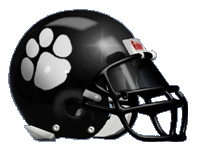 ELLINGTON, Sept. 22 – The 2012 campaign got off to a slow start as Ellington/Somers scored four TDs in the first quarter of a 47-7 decision on Saturday. Neil Janiga scored 3 TDs in the first quarter while Purple Knight QB John Lesile threw a pair of TD passes. Mistakes hurt the Tigerhawks, who snapped the ball over the head of QB Wilfredo Alicea four times in the first quarter, lost a fumble and had a punt blocked. Kayron Macon led the Tigerhawks (0-1) with 75 yards and one touchdown on 14 carries while Alicea ran for a team-high 85 yards on seven carries. Alicea completed 4-of-12 passes for 19 yards. HARTFORD, Sept. 15 – One year older. One year stronger. The Tigerhawks co-op football team from Sport and Medical Sciences Academy and University High in Hartford had 12 players that graduated from last year’s squad that played a full schedule of Pequot Conference football a year ago. But SMSA/University have some outstanding young men returning for another year with the Tigerhawks as the squad looks to improve on its 4-6 record from 2011. There are 58 players on the roster, an increase of 25 from the same time a year ago. Several key players return including junior quarterback Wilfredo Alicea, who passed for 1,274 yards and 14 touchdowns a year ago and the Tigerhawk’s leading rusher with senior Kayron Macon (709 yards, 7 TDs). Junior running back Ezekial Ortiz (36-189, 1 TD) returns along with junior receiver Eloy Aguayo. Senior Doshua Rodan will anchor the offensive line as center. Most players will play on both sides of the ball. Macon will start at linebacker with Rodan and Aguayo at defensive end and Ortiz as a defensive back. Sophomore linebacker Patrick Richards, senior defensive back Jonathan Cunningham and defensive end Daunte Brickley are expected to play well. “We’re not a big team but we’re athletic,” Boffi said. “More and more we feel like a cohesive, balanced team. It takes time to build that. The schedule is difficult from the start for SMSA/University, who face Ellington, the defending Pequot Uncas Division champion on Saturday on the road. Then the Hawks will face Avon, who has won 43 of 53 games in the past five years, Gilbert/Northwestern and Coventry/Windham Tech – all contenders for the Uncas Division crown and all CIAC playoff teams at least once in the past three years. Of note: Martin coached at Bulkeley for 23 years and led them to the Class LL championship game in 1991. He also coached in Canton for two years (2006-07) before coming to SMSA. … Scored school record 238 points in 2011, breaking the old record set in 1999 the first year of the team of 218. … Former Canton coach Roger Pearl joined the coaching staff as a line coach. … Martin, Boffi and Dennis D’Angelo are former Canton coaches. Note: For the second straight year, the Tigerhawks get a bye on opening week and a date with a tough Ellington/Somers squad. The Purple Knights went undefeated (10-0) in the Pequot Sassacus Division last year, won their first league title and qualified for the Class M tournament. Ellington beat SMSA/University, 53-12. Despite losing 15 seniors, the Knights are still a tough, hard-nosed running team. … For SMSA, this is the third year of the co-op team with University High in Hartford. Kadeem Johnson (21) looks to break a tackle in Friday night's game against Canton at Dillon Stadium. Tigerhawk captains Laurne Williams (73), Wilfredo Alicea (7), Kadeem Johnson (21) and Paul Zabulis (58) before a recent game.